New roots. Spring brings them every year, along with some delicacies that can only be enjoyed during these warming days…like fresh fava beans. Spring is the time these legumes behave, and taste, more like fresh new peas than later in the year after they mature, when they firmly join the bean clan (mostly dried or canned). 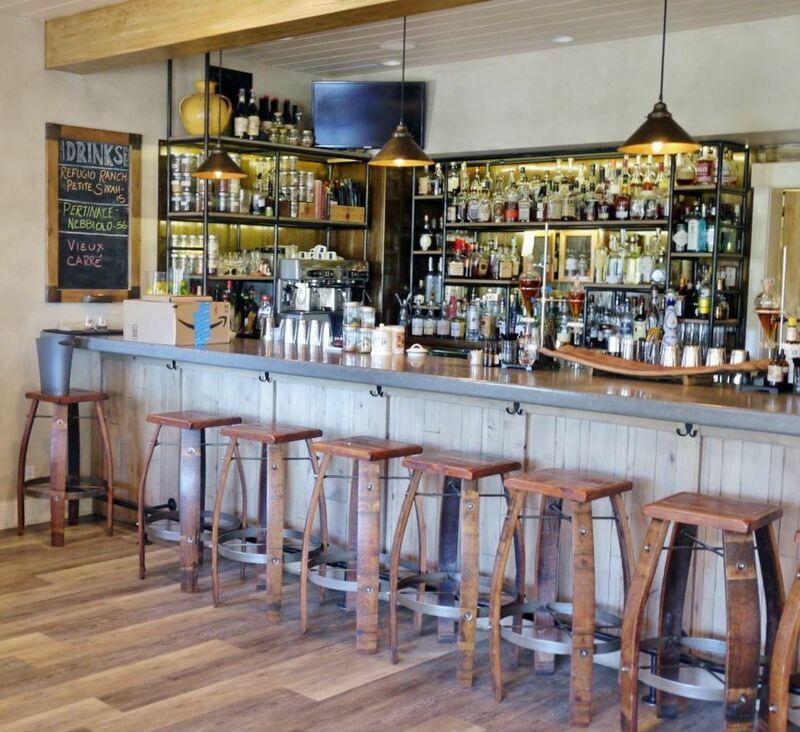 New roots are also springing up for Chef Crystal DeLongpre (known as Chef Pink for her hair color preference) as she takes over the reins at the Corque Hotel’s root 246 in Solvang. After stints at top kitchens of Los Angeles, the Food Network and running her own restaurant, she knew she could only go where her food philosophy would be shared: hyper-local ingredients, responsible sourcing via close relationships with farmers, stewards of the land. Now, Chef Pink is rejuvenating the kitchen at root 246, with 95% of its produce coming from local farms, as she moves the restaurant firmly towards its own rebirth. The dinner and bar menus have already been refreshed (but check for chef’s specials to appear anytime). In coming months, look for more casual, family-friendly dining, with a love for locals and a re-design focused on comfort. To make this spring comfort dish at home, remove the large outer pods from the fava beans, then take each bean and remove the thin skin covering the split bean. Next, hard-boil an egg, cool it down, peel it and set aside (or cure it by cracking an egg in a boil over salt, then cover it with salt and plastic wrap and refrigerate for 1 week). Tear lasagna noodles roughly (or use any other “badly cut” pasta) and boil per directions in a pot with enough salt to taste like the sea. Sauté thinly sliced and diced guanciale or bacon over medium-high heat, until it is crispy. Remove the bacon, then add 1/2 cup cut spring onion to the bacon fat and cook over low heat until translucent. Add 1 cup chicken stock and simmer until reduced by half, than add a handful of fresh fava beans to the pan, season with salt and turn down the heat. Add cooked pasta along with 1 tablespoon of butter and a healthy squeeze of lemon. After simmering for 2-3 minutes, sprinkle with bacon and grate the egg yolk over over the top. Chef Pink also adds locally foraged kombu – the “king of seaweed” used to make Dashi – which adds umami richness to the dish. Chef Greg Arnold’s modern plant-based cuisine at Mesa Verde Restaurant in Santa Barbara stimulates more than your appetite. Yes, the dishes’ vegetables come straight from the weekly farmers market. Yes, the menu’s inspiration comes from Mediterranean influences. But it’s the melding of all this plus art – what he calls “synesthesia” – that makes his food exquisite. A vegetarian himself, Chef Arnold elevates plants to starring roles using a Mediterranean mindset. “This style of cooking goes so well with California produce because of our similar climates,” says Arnold. “My salads come from what I find here at the market, because ingredients in season tend to pair well together.” The Mediterranean’s diverse spices also give Arnold’s dishes power: the menu is threaded with bold notes from the Middle East, North Africa and Southern Europe. It’s fusion cuisine at its best: street tacos, exotic spices, starring veggies and also art. Growing up painting, playing music and cooking, Arnold realized that with food, our senses mesh. How a dish looks and tastes is intermingled. So, beauty becomes delicious. To make this simple salad, Chef Arnold roasts carrots in the oven with cumin seeds, thyme and olive oil until soft, then purées them. He also blanches fresh peas in salted water (it should taste like the ocean) for 1 minute, moves them to an ice bath, then purées them with water and lemon. He paints the plate with both, then adds halved peas and okra, torn kale and slices of cucumber, yellow squash, fennel and endive. Topping the salad is a sprinkle of blueberries, wood sorrel leaves and flowers with powdered sumac and chlorella on the side. The dressing is also simple, yet powerful. Chef Arnold reveals his favorite super-easy vinaigrette based on a classic Levantine salad: fattoush. He blends grapeseed oil (it’s lighter than olive oil), lemon, fresh garlic, fresh thyme, salt and sumac, then lightly drizzles it over the top. Obsessed taco lovers know that a great taco is all about the tortilla. In Santa Barbara County, we’re in luck; we know many restaurants and taco stand that hand-make tortillas from scratch, from masa imported from Mexico. It’s the real deal. But Conrad Gonzales, the chef behind Valle Eatery & Bar in Lompoc and Vallefresh catering and taco bar in Los Alamos, is kicking that up a notch by growing traditional heirloom Mexican corn right here in Goleta, California. Christmas has come early – this time in August. As I stand in the middle of an unruly, all-natural cornfield in Goleta, leaves waving wildly in the breeze, I witness two men peeling back the dried, yellowed husks of what looks like overripe corn. They are getting their first glimpse at heirloom green corn kernels they have planted earlier this year. The two friends are giddy, excitedly peering into their cob treasures and calling out the colors they find. They look like kids on Christmas morning. Emerald green, yellow gold, blood red, forest green and gray-green are some of the colors we find inside the whispery husks. These are the fruits of a new culinary experiment here in Santa Barbara County: planting Heirloom Oaxacan Green Dent corn seeds, an ancient corn of the Zapotec people of southern Mexico, to see how well it can be cultivated here. It’s been grown there for centuries and is traditionally used to make green-flour tamales and other staples like tortillas, polenta or corn meal for breading. Local culinary school buddies Conrad Gonzales and Abel Basch started this project with a mission to introduce new varieties of heirloom corn—those that we have never heard of or seen before—and to make homemade tortillas the traditional, sustainable way it’s been done in Oaxaca for hundreds of years. Born in Santa Barbara, Gonzalez is a 4th-generation Californian, with family roots in Mexico City. He’s been cooking in the area for over 15 years, then he went out on his own in 2014, now heading up Valle Eatery & Bar in Lompoc and Vallefresh catering and taco shop in Los Alamos. He quickly became known around the County for his savory pork belly tacos and homemade tortillas. Abel Basch grew up in Los Angeles and came to Santa Barbara for culinary school—where the two friends met—then cooked in restaurants all over Santa Barbara before realizing his first love was growing food. And heirlooms are his thing. Gonzales has always wanted his food creations to be a true fusion of his family’s Mexican culture and his Central Coast upbringing. He also wants his dishes to be organic, locally sustainable and true to their roots. Gonzales wanted to make tortillas the truly authentic way – which is also the truly sustainable way (and happens to be local, organic and GMO-free) – like they have in Oaxaca for thousands of years. Gonzales knew his friend and colleague would be into it, and when he introduced the subject, Basch jumped at the chance. “If you get me the seeds, and promise to buy the entire yield from the crop, I’m in.” Basch told him. Gonzales already had the seeds picked out. To harvest, the corn is hand-picked after the husks are dried and yellowed and the corn has become hard. The corn is then milled by hand to remove the kernels, and the kernels are cooked in a solution of water and lime calcium. After they rest for 1 night, the softened kernels are ground in a stone mortar and pestle until they become a wet paste. This is the masa. To make a tortilla, Gonzales rolls a small amount of pure masa into a ball, then flattens it (you can use a tortilla press) and grills each side on a griddle or cast iron skillet until browned. The taste is earthy, dense, savory and meaty. It’s a deeper, more intense flavor than typical hand-made tortillas, but also has a light note, just a little floral. This tortilla plays the starring role in a taco, instead of a delivery vessel for the fillings. This is the pure taste of ancient culinary culture: this tortilla is pure corn, no salt or other additions. And it’s better; heirloom corn has more nutrition, protein, flavor and variation than modern corn that is widely available. “This is as close to historically accurate food as we can get, for a tortilla. And now, we can have an heirloom Santa Barbara tortilla. Only at Valle restaurants,” Gonzales says with a smile. Basch reminds us we can also make green heirloom whiskey, as well as polenta, grits and fresh masa for sale to other cooks. Gonzales would also love to someday make tortillas, chips, tostadas and masa to sell to the public and restaurants. “A Valle Fresh heirloom tortilleria in Santa Barbara County…that would be awesome,” Gonzales says. The bright green corn has now been harvested, and Gonzales is busy processing it, grinding it into masa and making homemade tortillas from it. That makes his the most authentic tortilla around. Don’t miss his Goat Cheese-Stuffed Fried Squash Blossom Taco on an heirloom green corn tortilla with green tomatillo sauce, pinquito beans, Cotija cheese and avocado at his eateries this fall. If you find heirloom dent corn, first cook it in a solutions of water and lime calcium until softened, then after letting it rest for 1 night, grind it into a paste with a mortar and pestle to get the masa (or buy fresh masa from local shops that sell Hispanic foods). Boil pinquito beans in water, garlic and bay leaf until tender, at least 1-2 hours. Make a green sauce by blanching tomatillos and roasting poblano peppers, then blending these with jalapeño, garlic, onion, lime and salt and pepper. Roll a small amount of pure masa into a ball, then flatten it with a tortilla press, and grill each side on a griddle or cast iron skillet until browned (or use authentic corn tortillas from the store – local or unlabeled are best). Heat ¼ inch of oil in a pan (or heat up a deep fryer). Stir together ¾ cup flour and 1 egg, then slowly whisk in ½ cup sparkling water or beer to make a light batter. Stuff the squash blossom with goat cheese, dip in the batter, then place in the hot oil and fry until golden (about 2 minutes). Lay a tortilla on the plate and drizzle with tomatillo sauce, then top with avocado, pinquito beans, a squash blossom, Cotija cheese and epazote (a Mexican herb similar to oregano or mint) or cilantro. Serve with lime. If you’ve never tried the Roasted Local Vegetables at Los Olivos Wine Merchant & Café, this fall is the time! And after you’ve had it cooked to perfection by him, read below to make it at home yourself. It’s served with smoked mozzarella, arugula and house-made tapenade. Chef Joslyn roasts the vegetables on separate pans at 400-450 degrees, to get the exact amount of softness and carmelization for each one. This can take from 25-45 minutes; you’ll need to taste them to make sure each pan is done. He then heats a skillet or cast-iron pan, places smoked mozzarella in the middle and piles on the veggies, adding a dollop of tapenade and a smattering of arugula. Chef Joslyn uses Rancho Olivos extra-virgin olive oil from Santa Ynez in this and other dishes at the Café. Since the first harvest, owner Shannon Casey has invited folks to visit the farm and taste the oils right next to the olive trees that produce them. The dry climate in the Santa Ynez Valley, with its long warm days and crisp evenings, is the ideal environment for olive trees. The Caseys farm the trees sustainably, tend the orchards themselves, handpick the olives during harvest and have them sent to be milled within a few hours of picking. To make the oils, the Caseys blend olives from two varietals (one Italian and one Spanish): Frantoio and Leccino. They believe this combo to be the most pleasing to most people. Locally-grown garlic is easily sourced in summer and fall. When local supplies run out, the restaurant looks further upstate for year-round garlic from none other than Gilroy, the self-proclaimed “Garlic Capital of the World.” If you’ve ever been close to Gilroy, you know this nickname is correct by the garlic smell! Living in Santa Barbara County all but guarantees us locally grown produce year-round, but spring can bring surprises depending on rain. This year, fields are bursting with growth – green hills and abundant vegetation are everywhere. And that gets chef Francesco Crestanelli of S.Y. Kitchen excited. Plentiful rain is causing chanterelle mushrooms – large, fleshy and meaty – and wild nettles – leafy and vibrant green – to pop up in fields all over the County. 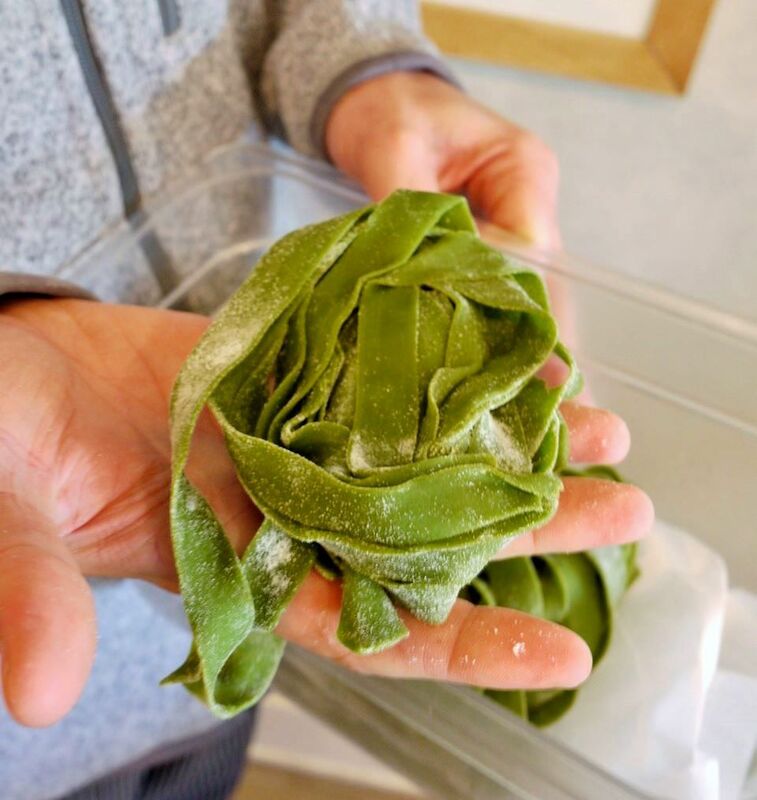 Crestanelli, brother and partner of chef Luca Crestanelli, loves to gather the nettles and chanterelles himself for dishes in the restaurant, sometimes in a field across from the restaurant in Santa Ynez. Nettles, which have a ton of vitamins, are considered an old, classic ingredient in his native Verona, Italy, and lend a beautiful green color to S.Y. Kitchen’s daily handmade pasta. 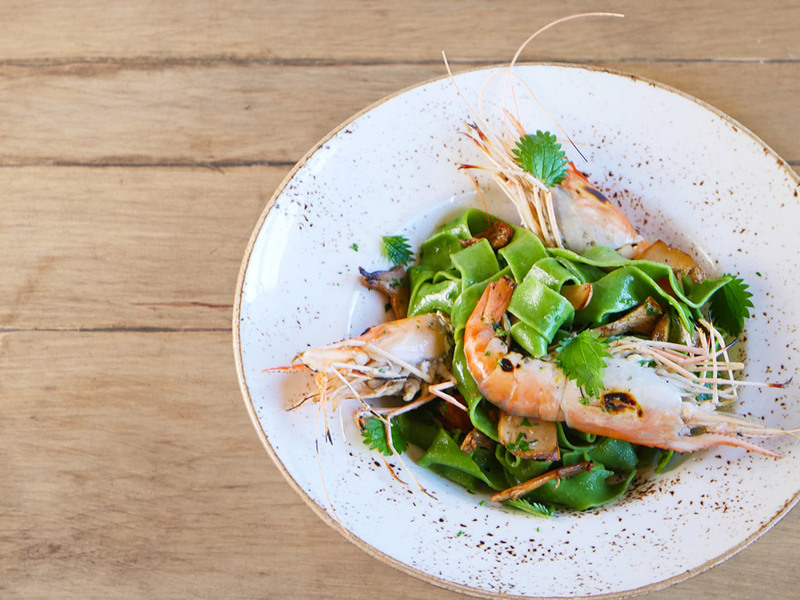 Crestanelli also adds Santa Barbara spot prawns, which are sweet and so fresh they are sometimes just hours out of the ocean. 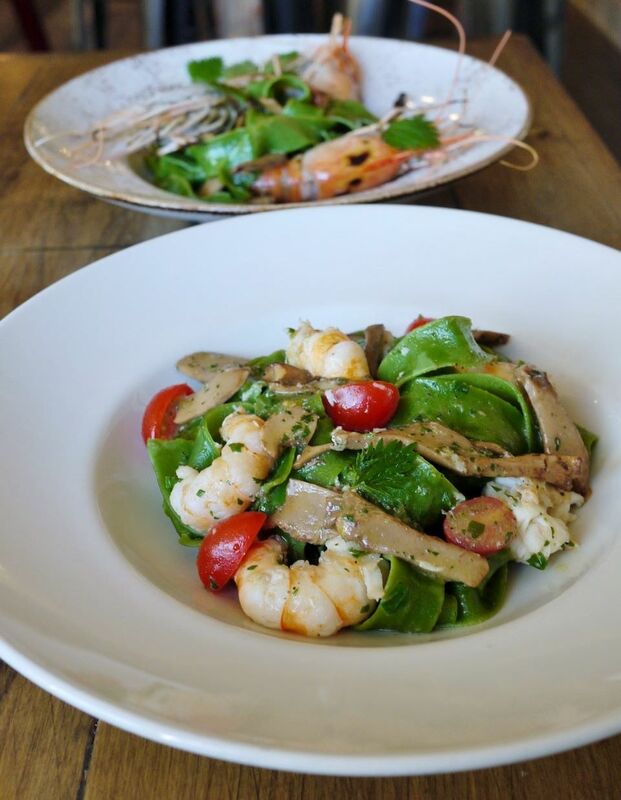 To make this Italian “Surf & Turf,” blanch the nettle leaves and drain (make sure to handle raw leaves with gloves). Then blend them with a farm egg, and combine with flour and salt. Knead and rest the dough, then roll out and cut. Sautée garlic, Italian parsley and red chile flakes in extra virgin olive oil (preferably from Italy) over med-high heat. Add the cut mushrooms and prawns (cleaned and shelled) and cook for 2-3 minutes. Boil the fresh pasta in water and salt for 2-3 minutes, then drain and add to the pan along with cherry tomatoes. Cook, stirring, for 1 minute and add salt and pepper to taste.